Discovering Europe: all-inclusive Escorted trip - the best of Venice on foot. NOTE: We reserve 'classic' rooms at the Danieli. If you would like to upgrade to a 'deluxe' room with views of the lagoon, please contact the office. From Venice Marco Polo airport a private water taxi will speed us across the Lagoon to Venice (30 minutes) and through a network of canals before emerging at the top of the Grand Canal – where our hotel – the 5* Hotel Danieli, is situated, on the waterfront, a brief stroll from the central Piazza San Marco. There is time to explore before dinner at one of the city’s most renowned restaurants. We explore Venice’s tiny alleys and bridges, visit the tombs of the Doges in the church of SS. Giovanni e Paolo and the Scuola di San Giorgio degli Schiavoni, with its nine unforgettable paintings by Carpaccio. Lunch, exclusive to ATG, is at a private palazzo on the Grand Canal, offering a unique insight into the lives of Venetian aristocracy. Optional afternoon visit to the Accademia. In the evening we enjoy a private guided visit to St Mark’s Basilica, illuminated specially for us, its domes resplendent with gold mosaic. We visit the Doges Palace and Museo Correr, before meeting for lunch at another fine private palazzo on the Grand Canal. After lunch we cross the Grand Canal to the San Polo district to visit the magnificent Franciscan Church of Santa Maria Gloriosa de Frari, and then see Tintoretto’s masterpieces at the Scuola di San Rocco. We take a boat trip to the islands, visiting Burano, with its pastel coloured fisherman's houses, and Murano, little changed since the 15th Century, when the glass kilns of Venice were moved there – for safety! We continue to tranquil, sparsely inhabited, Torcello, once a great city, however for greater safety and malaria people moved from there to the Rialto (present day Venice). We visit the cathedral with its 9th Century bell tower and adjacent 11th Century polygonal church of Santa Fosca, before returning, across the lagoon to Venice (1.5 miles excluding visits). Return to Venice Marco Polo airport by water taxi (30 mins). If you would like an extension booking at either end of your trip please indicate this during the booking process and we will contact you with pricing information. Though the fitness rating for this trip is Grade 1, with walks comprising gentle sightseeing strolls, please note that there are many steps over bridges and inside buildings to negotiate. Most monuments and other buildings do not have lifts. You must be sufficiently nimble to be able to get on and off water taxis and 'vaporetti' (water buses). Please also consider that at times of 'acqua alta' (high water), when the only way to walk about the city is on duckboards (wooden slats), your walking must be stable and confident in order to enjoy the itinerary. Sturdy, comfortable footwear and warm clothing is recommended, and bring your Wellingtons just in case of 'acqua alta'! Venice has wonderful fish and seafood from the Adriatic. Polenta, made from maize flour, has long been a staple of north-east Italy, as has risotto. The wines of Veneto are varied and include some well-known grapes – both French and indigenous, such as Cabernet, Refosco, Raboso and Chardonnay; light, fruity reds, crisp whites and delightful sparkling wines. Does the hotel have WIFI, hair dryers, laundy service? Just want to say that this was a superb holiday from start to finish. Hotel, food, wine, programme, weather, leaders were all first class. Highlight of holiday private visit to St Marks Basilica. 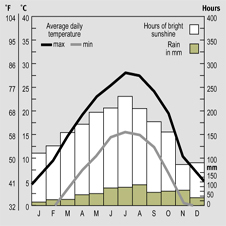 December & January: cold, crisp bright days with a possibility of rain; Spring is generally mild. We operate this trip at times of year when it is least crowded and you experience Venice as 'itself', rather than with throngs of tourists. During this off-season there is an increased risk of 'acqua alta' and we strongly recommend you bring Wellington boots and waterproofs. Note, however, that high water does not have a detrimental effect on the trip. The Venetians place Duck Boards around the city for people to walk on and for any areas that we wish to access wherethis is not possible by Duck Board then we will take a water taxi. This is a 5-day trip with 3 days of city walking. Unlike most of our other trips, the walking is of an urban nature, and is combined with a great deal of sightseeing - please bring comfortable and supportive footwear. Though the fitness rating for this trip is Grade 1, with walks comprising gentle sightseeing strolls, please note that there are many steps over bridges and inside buildings to negotiate. Most monuments and other buildings do not have lifts. You must be sufficiently nimble to be able to get on and off water taxis and 'vaporetti' (water buses). Please also consider that at times of 'acqua alta' (high water), when the only way to walk about the city is on duckboards (wooden slats), your walking must be stable and confident in order to enjoy the itinerary. Sturdy, comfortable footwear and warm clothing is recommended, and bring your Wellingtons just in case of 'acqua alta'! You don't have to! On this trip it is very easy for you to opt in and out of daily activities as the Danieli hotel is very centrally located- and a very nice place to relax and enjoy!. The Tour Leader will tell you each evening about the next day's schedule and you can plan accordingly. 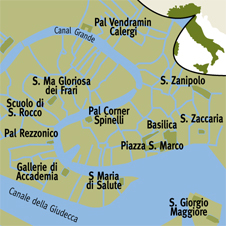 The destination airport for this walking tour is Venice Marco Polo. There will be a set meeting time at Venice Marco Polo airport for the transfer to the first hotel; a set time for the return transfer to the airport at the end of the trip; and a 'recommended flight' to connect with the airport transfers. Booking the recommended flight - which we strongly encourage - guarantees transfers to and from the airport, irrespective of flight schedule changes or delays. For clients not on the 'recommended flight' we cannot guarantee a transfer from the airport should you be delayed for any reason in meeting the group at the specified place and time. In this instance you will have to make your own way to the first hotel, at your own expense. The transfer to the airport at the end of the trip will also be timed according to the recommended flight and we cannot offer transfers at alternative times. Please check with the Reservations Team before making independent arrangements. You are of course welcome to meet the group at the first hotel. your flight arrives at the destination airport at least 1 hour before the meeting time, to allow sufficient time to pass through customs and collect your luggage. If you take the recommended flight or are meeting the group at the airport our Tour Leader will be waiting to meet you for the private water taxi transfer to the first hotel, which will depart shortly thereafter. S/he will be wearing a green polo shirt bearing the ATG logo. If you arrive late and find that the group has left, please check for a message at the information desk and make your own way to the first hotel, letting the ATG office know you’re on your way. The ATG office number is +44 1865 315 678 or outside office hours please call the emergency number which is +44 1865 315 600. If you are meeting the group at the first hotel, our Tour Leader will contact you upon their arrival. Bring whatever clothes you find most comfortable for sightseeing, comfortable shoes, wellies, waterproof coat and a change or two for the evenings. We eat in some quite smart restaurants on this trip where a jacket or skirt/dress would be appropriate. For a comprehensive checklist click here, though for this trip you do not need to bring items appropriate to more adventurous 'walking' trips (eg walking boots, walking socks and poles). On our escorted Venice walking tours all meals are included. On this trip all breakfasts will be at the 5* hotel Danieli, which offers a 5* breakfast! As we are in a city rather than countryside we enjoy restaurant (and private palazzi!) lunches instead of picnics. Evening meals are at wonderful local restaurants. Veneziana (calves liver cooked in butter, wine and onions), whilst the cereal staples of the area are rice (often served in the form of risotto) and polenta, a dish made from boiled maize flour, typical of the plains of northern Italy. The Veneto, (which, with Fruili-Venezia Giulia and Trentino Alto-Adige, form the Tre Venezie) makes more DOC wines than any other region, and some of these – Valpolicella, Soave and Bardolino – are instantly recognisable to the rest of the world. Although wine has only been produced in large quantities in more recent years, the region has been famed for its wine since Etruscan times, and was particularly favoured by the Romans. unpretentious though enjoyable ‘quaffing’ wines, there are fine wines produced in the region too – most of these coming from the Alpine foothills and the plains between Lake Garda and the north of Venice, and the plains around Vicenza and Padua. Also produced in the area is Prosecco, a dry, sparkling white wine, which was used as the base for a famous invention in the ‘thirties by the barman at Venice’s glamorous Harry’s Bar – the Bellini, a delicious mixture of Prosecco and peach juice. We visit a variety of wonderful restaurants. When you book, let us know about any restrictions. This will give the Tour Leader the opportunity to prepare menus accordingly prior to your trip. At the start of the trip the Tour Leader will meet with you to discuss in more detail your requirements. trousers for women, but the dress code is not dressy – suits are not necessary. Please note that shorts and T-shirts are not acceptable at the restaurants. The destination airport for this trip is Venice Marco Polo. There will be a set meeting time at the airport for the transfer to the first hotel; a set time for the return transfer to the airport at the end of the trip; and a 'recommended flight' to connect with the airport transfers. Booking the recommended flight - which we strongly encourage - guarantees transfers to and from the airport, irrespective of flight schedule changes or delays. For clients not on the 'recommended flight' we cannot guarantee a transfer from the airport should you be delayed for any reason in meeting the group at the specified place and time. In this instance you will have to make your own way to the first hotel, at your own expense. The transfer to the airport at the end of the trip will also be timed according to the recommended flight and we cannot offer transfers at alternative times. Please check with the Reservations Team before making independent arrangements. You are of course welcome to meet the group at the first hotel. Please indicate your intention during the booking procedure.